Monte Carlo, May 26, 2017 – Fairmont Monte Carlo, a luxurious hotel located on the Côte d'Azur and in the heart of the Principality of Monaco, provides travelers with unparalleled access to breathtaking views of the legendary Fairmont Hairpin turn during Formula One’s famed Monaco Grand Prix. 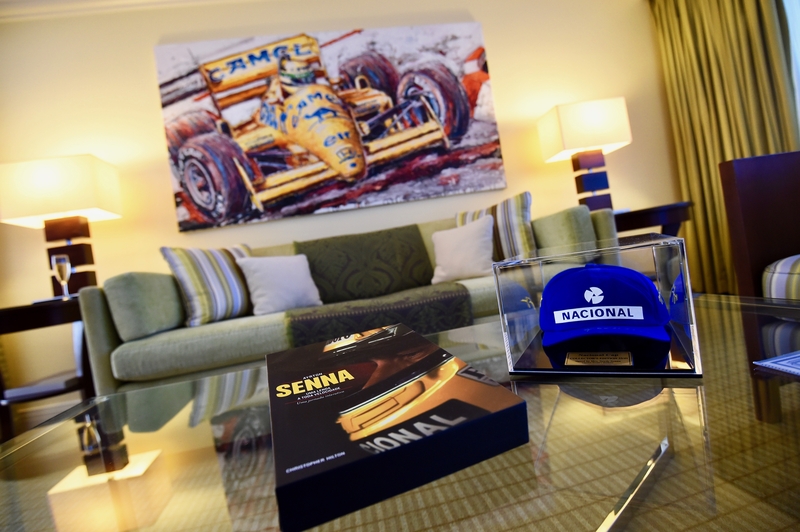 Already allowing guests to take in all the race action from three incredible suites honoring former F1 icons, the hotel is accelerating the excitement with the debut of a fourth racing suite dedicated to World Championship driver Ayrton Senna. The suite, decorated with signed photos and memorabilia of Ayrton‘s six victories in Monaco, was officially inaugurated with a special tribute that was attended by Bianca Senna, member of Ayrton Senna’s family and HSH Prince Albert. What is it about a suite that stokes the imagination? A luxury of private space - an expansive area for lounging, entertaining and creating a home away from home. Or maybe it’s the privileges that some suites confer - private butlers, plunge pools and unmatched views. At Fairmont, the luxury brand’s suites are so remarkable they are often considered among the world’s best and include the most iconic, celebrated and aspirational accommodations available. For those in the mood for something Suite during their next trip, Fairmont has assembled a global collection of spectacular and iconic accommodations. From penthouses to beach villas to luxury tents, Fairmont is certain to have a suite that will appeal to every type of luxury traveler. Some highlights are included below and more information and options can also be found at fairmont.com/suites. Bali is the ultimate ‘get-away-from-it-all’ destination and also home to the absolute biggest suite in Fairmont’s portfolio. At Fairmont Sanur Beach Bali, the Presidential Beachfront Villa is a magnificent 937 square meter (over 10,000 square foot) two-bedroom villa suite featuring a private 130 meter (over 425 foot) swimming pool and a private spa treatment room with a steam room designed for two. Surrounded by lush tropical gardens, the suite also delivers private sundecks overlooking the beach, where guests can gaze out at the island of Nusa Lembongan and the deep blue Indian Ocean beyond. Guests of the suite also enjoy 24-hour on-call butler service and complimentary access to the Club House and the kids club. Reminiscent of Spain’s palaces, France’s sun-washed coastal retreats and Florence’s decorative arts, Fairmont Grand Del Mar in San Diego exudes old world elegance and epitomizes romance. Terracotta tiles, stone archways and fine antique furniture define the Brisa Villa suite, a 418 square meter (4,500 square foot) villa that combines the privacy and romance of a palatial Mediterranean inspired home with the conveniences and amenities of a world‐class hotel. It offers three bedrooms, four-and-a-half marble bathrooms, living and entertaining areas, a media room and a French country style kitchen. Elegant and spacious, the Royal Suite at Fairmont Baku offers stunning artwork, lofted ceilings, sumptuous furnishings and attention to detail. Perched on the 27th and 28th floors of the tallest building in Azerbaijan, the striking floor-to-ceiling windows provide stunning views of Baku city and the Caspian Sea. Two bedrooms with ensuites, a living room, kitchen, private dining room, study and separate guest bathroom, provide extensive living space. The contemporary, chic decor is complemented perfectly by all the amenities one would need, including exclusive Fairmont Gold privileges. It is only fitting that Canada’s “Castle in the Rockies”, Fairmont Banff Springs, has an opulent Royal Penthouse Suite, specially designed for royalty, dignitaries and extra special occasions. This unforgettable suite features a reception foyer, spacious living room, grand piano, upper perimeter library, powder room and multiple windows. The attached master bedroom is private, featuring a spectacular chandelier, cozy window seat and additional bathroom. Located in the pinnacle of the Castle’s peak, the suite and master bedroom offer magnificent panoramic views. When is a suite not a suite? When it’s a luxurious tent of course. Located on the fringe of the Masai Mara, commonly referred to as Africa’s greatest wildlife reserve, Kenya’s Fairmont Mara Safari Club has introduced a tented experience perfect for families or larger groups. A spacious and fully furnished tent can comfortably accommodate upwards of six people and offers plush sofas, comfortable armchairs and a large dining table, four poster beds and modern en-suite bathrooms. An expanded outdoor balcony provides a perfect setting for viewing an astounding array of animals including zebras, cheetahs, gazelles and of course, the “Big Five”. Fairmont Mayakoba is a haven of enticing water features, from the nearby Caribbean Sea, the navigable water canals that weave through the property and the resort’s five pools, including a children’s pool and waterslide. Many suites feature private infinity pools, including the impressive La Tortuga Presidential Suite, with a pool overlooking the canals and tropical forest. Modelled like a private residence, this villa is located on its very own island near the main pool area. It offers a spacious, elegant master bedroom and a luxurious four-piece marble bathroom with a deep soaker tub and a private glassed shower stall. Fairmont Le Château Montebello, the world’s largest log cabin, is found in a magnificent natural setting at the foot of Quebec’s rugged Laurentian Mountains, creating the perfect venue for romantic winter adventures. Picture cozy nights in the over-sized Jacuzzi Rooms, with their rustic yet elegant, chalet-inspired décor, as the outdoors, nature in all its picturesque glory beckons. In addition to well-defined living and sleeping areas and other amenities, these spacious rooms feature a two-person Jacuzzi, perfect for newlyweds or couples looking to recapture that honeymoon spark. Toronto’s Fairmont Royal York has hosted three generations of the British Royal Family in its Royal Suite, and the guestbook also features the signatures of King Juan Carlos and Queen Sofia of Spain, King Hussein of Jordan and Prince Karim Aga Khan. Dating back to 1929, the two-bedroom 16th floor suite’s most impressive feature is its grand entrance foyer, which invites guests into its elegant and lavish living room. Other features include a one-of-a-kind molded ceiling, original oak fireplace, woven carpets, oil paintings, intricate mirrors, and two wet bars. With a full dining room, this suite has even hosted weddings, with enough space to easily accommodate 16 guests. London’s The Savoy, A Fairmont Managed Hotel features several exceptional Personality Suites, luxury quarters named for famous past residents. These include tributes to Maria Callas, Winston Churchill, Charlie Chaplin and Katharine Hepburn. The elegant Edwardian one‐bedroom Monet Suite is composed of the exact two rooms that Impressionist artist Claude Monet favored during his three trips to London between 1899 and 1901. He spent months at a time painting and repainting the east and west views of the River Thames from this sixth‐floor vantage point, in different lights, at different times of day, and in differing weather conditions. When he returned to France, Monet kept only 37 canvasses as his London Bridges series of paintings.